Parasites are everywhere, affecting almost every aspect imaginable in the life of their hosts including physiology, behaviour, life histories and, by implication, the structure of entire ecosystems. To cope with these constant threats, host immune defences have evolved to become one of the most sophisticated natural systems known. Despite this, parasites have found their own ways to overcome defences and exploit their hosts. Consequently, hosts and parasites have been constantly forced to adapt to one another; sometimes changes have occurred very rapidly, whilst others have taken eons. This evolutionary arms race has had far-reaching consequences for the biology of both parties. Over the last decade, principles from evolution and ecology have increasingly been applied to the fields of parasitology and immunology in an attempt to foster a common conceptual framework that uses a priori principles to unravel the diversity of host-parasite phenomena. This has led to the emergence of some of the most important, highly successful and inter-disciplinary areas of modern biology - the as yet separated fields of ecological immunology and evolutionary studies of parasitism. 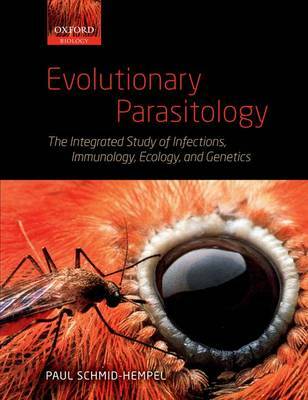 This novel book provides the first comprehensive overview of the many facets of host-parasite interactions, from the molecular bases to adaptive strategies and their ecological and evolutionary consequences. It is informed by the very latest progress in the field. No longer do we view well-adapted parasites as becoming ultimately harmless. To the contrary, parasite virulence is determined both by the processes that lead to harm and by the evolutionary costs and benefits of this damage. Similarly, parasitism is no longer regarded as being inevitably deleterious; rather it can be a major factor maintaining diversity in populations and communities, selecting for beautiful plumages of birds, or even making us more social. Evolutionary Parasitology integrates material from a wide range of topics including immunology, genetics, sexual selection, population ecology, behavioural ecology, and evolutionary biology. Graduate students and researchers from different fields and with different backgrounds will find this book a valuable reference to meet their interests and to expand their insights into neighbouring disciplines.